Victoria Memorial was Lord Curzon's brainchild as a memorial to the Empress of India and Queen of the United Kingdom, Queen Victoria after her death in 1901, the Victoria Memorial was modelled. The Indian Museum is the largest museum in Asia and the oldest in the Asia - Pacific region (est. 1814 at the location of the Asiatic Society). The Birla Planetarium in Kolkata, West Bengal, India, is a single-storeyed circular structure designed in the typical Indian style, whose architecture is loosely styled on the Buddhist Stupa at Sanchi. 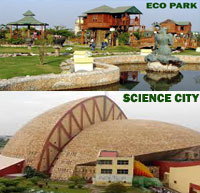 Eco Park is an urban park in Rajarhat, Kolkata. The park is situated on a 480 acres plot and is surrounded by a 104 acres waterbody with an island in the middle.